According to the introduction of Will Shortz Presents Easy Kakuro: 100 Addictive Logic Puzzles (published by St. Martin's Griffin, 2006) by Will Shortz, Crossword Editor of The New York Times, Kakuro is one of the oldest grid logic puzzles in existence traced back to the April/May 1950 issue of Official Crossword Puzzles by Dell Publishing Company. Also according to Shortz, those early Kakuro puzzles, titled Cross Sums, were the "brainchild of a Canadian building constructor, Jacob E. Funk" and were "published intermittently at first, grew in popularity, and by the mid-1960s were appearing in every issue of every Dell puzzle magazine." Since then, Cross Sums puzzles have been available in the USA by Dell and Games magazines, as well as in many other countries. According to the Cross Sums article in Wikipedia, these puzzles have been a regular feature in most math-and-logic publications in the USA for many years. Cross Sums road to fame was identical to Sudoku. They were first imported to Japan by Nikoli Puzzles, improved, re-branded to Kakuro, became a big success and then exported back to the West. In 1980 Cross Sums were imported to Japan by Maki Kaji, president of Nikoli puzzles, who named them Kasan Kurosu - a combination of the Japanese word for "addition" and the Japanese pronunciation of the English word "cross." In 1986, six years after their initial release in Japan, Nikoli re-branded Kasan Kurosu as Kakuro, a common abbreviation method which is used in Japan. The company then released its first dedicated Kakuro booklet, followed by 22 additional volumes till today. According to Wikipedia, Nikoli has sold about one million Kakuro books in total. Today, Kakuro puzzles from Nikoli appear in 100 Japanese magazines and newspapers and its popularity in Japan is second only to Sudoku. The third most popular puzzle is Slitherlink, which is an original Nikoli invention. Kakuro wasn’t always the second. According to Maki Kaji, Kakuro was Nikoli’s top ranking puzzle from 1986 to 1992, when it was overtaken by Sudoku which rules the top of the list until today. Other major Kakuro publishers in Japan, after Nikoli, are Gakken and Sekai Bunkasha. 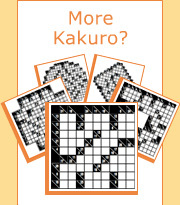 Sparked by Sudoku’s sensational worldwide success, the Kakuro boom in the West started in September 2005 when The Guardian and The Daily Mail introduced daily Kakuro puzzles in the UK. Kakuro books were also exhibited in the Frankfurt book fair 2005. As the new craze emerges, following the footsteps of Sudoku, Kakuro puzzles are penetrating mass media channels and are being adopted by main stream book and magazine publishing houses. During 2006, Sterling Publishing released 8 books with Conceptis Kakuro puzzles, including Black Belt Kakuro, Brown Belt Kakuro, Green Belt Kakuro, White Belt Kakuro, The Big Book of Kakuro, 1001 Kakuro puzzles and more. Today, dedicated and mixed magazines and books with Kakuro by Conceptis are published regularly in the 35 countries including USA, Japan, Germany, Netherlands, Canada, Russia, Finland, Israel, Hungary, Austria, Spain, Norway, Sweden, Greece, Switzerland, Italy, Czech Republic, Brazil, Turkey, Korea, Thailand, Romania, Philippines, Estonia, Latvia, and more.